Back in June, my husband and I took a train trip to nowhere. You know the kind: excursion trains that haul mostly grandfathers and grandsons on a trip down memory lane, but with plenty of womenfolk along mainly just for the ride. At least that described me. Pulling our train was a locomotive known technically as the “Class J 611,” or “611” for short, one of three locomotives from the historic Norfolk & Western line currently based at the Virginia Transportation Museum about two hours south of us in Roanoke Virginia. Railroad buffs, history fans, preservationists and interested volunteers provide opportunities throughout our region (North Carolina, Virginia, and northern Virginia right outside Washington, D.C.) where you can still see Norfolk & Western’s “golden age of steam power” in action and ride in cars being pulled up decent grades by old fashioned coal and water. The Norfolk & Western was the last major steam railroad in America, and lost steam, so to speak, when train power changed from steam to diesel. A photographer of the day loved those steam locomotives. His name was Winston Conway Link and he was known for his classic and iconic photos of trains puffing through the countryside especially at night—photos carefully crafted with lighting, lens, and posed Norman Rockwell-type moments—a father and son heading home after chopping down a Christmas tree, for example. Link wanted the photos to honor both the people who relied on the 611 running on schedule through their countryside every day, which gave them “pride and [was] a testament to rail workers they personally knew” (611 Magazine, Spring 2016, p. 20). 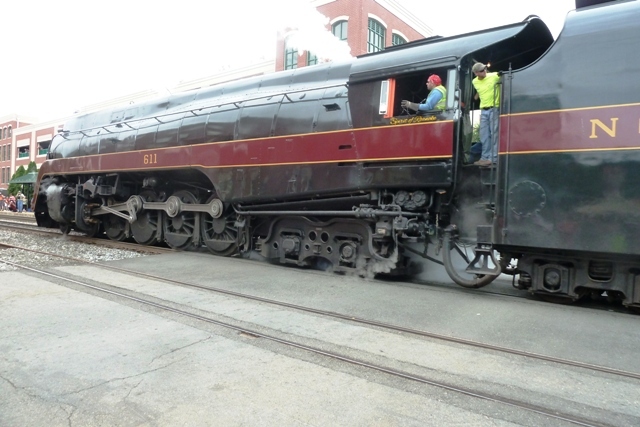 Link wanted to preserve one sample of each of the N&W steam locomotives, called Class A, Class J and Class Y* (all built in Roanoke in the 1940s – 50s). Winston kept the Class J 611 out of the scrap yard with his offer to buy the locomotive. He never acquired it, but his goal to have it saved was accomplished never-the-less. (Link’s work can be found in the O Winston Link Museum in Roanoke and books; he died in 2001). 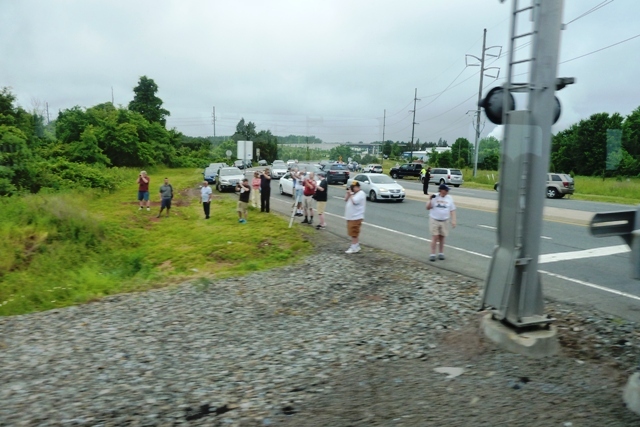 So we got to board a passenger car being pulled by the “611” in Manassas, Virginia where we had to make way for early morning farmer’s market vendors which usually occupy the streets on Saturday mornings. The lines for us to stand in were all well-marked on the street: more than 1000 passengers boarding about 20 cars in a squeeze of time. But that wonderful pre-planning got scrubbed as the vendors made clear who had right of way there: their food and market trucks. No matter. The excursion bound riders were all in great spirits, chatting up our line mates and anxious for the big 611 to roll into the station. 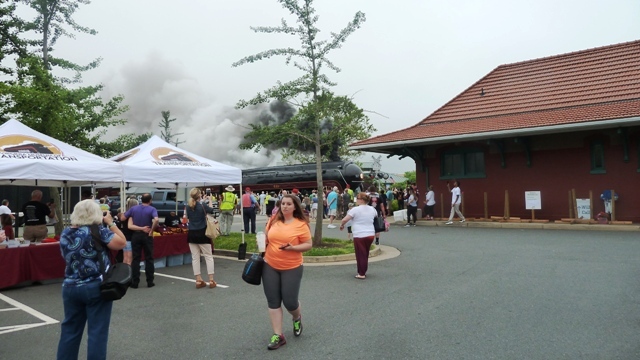 I was not positioned well, but you can see the 611 pulling in to the Manassas station here. I’ll never forget the adrenaline that shot in with the 611 engine and the cars it was pulling. And it was pretty. A kid, about nine, began shouting, “It’s coming, it’s coming,” and started running towards our crowd, the better to get the best possible view. The cry was electric, charging us all up for the trip to nowhere. And the 611 did her best to belch out the blackest smoke she could manage. EPA, look the other way. We rode the rails back to the town of Front Royal, which we had already passed that morning on our way to Manassas from Harrisonburg. But, we were a little surprised to learn, (had not read the fine print very well) that we wouldn’t be allowed to get off in Front Royal at all. Actually, the logistical nightmare of boarding and reboarding 1000 passengers, in the relative middle of nowhere, would not have been wise and would have made the excursion even longer. And no offense to Front Royal: a lovely old timey town with antique stores, vintage 50’s motels, and a popular ice cream and hamburger joint, Spelunkers among many other attractions. But the best part for me, a train buff only because it means I get to travel somewhere, was feeling like we were celebrities or presidential candidates passing by all those country intersections lined with tripods, cameras, and video equipment. People raced to capture images and movies of the 611 passing through like it was 1916 instead of 2016. The hordes of photographers would quickly run to their vehicles as soon as we passed to head to the next viewing spot, called “chasing” the train. What a gas. Or a lot of steam. I soon discovered that it looked like the people out chasing the train were having the most fun. 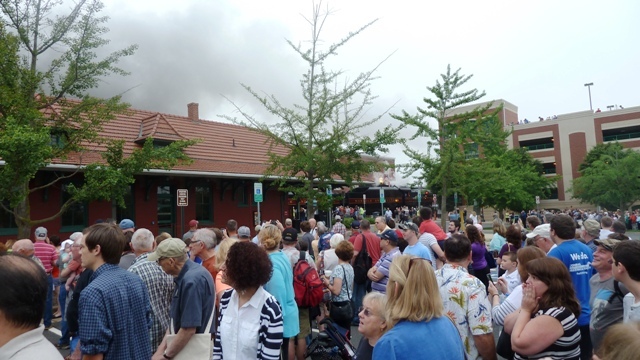 When we pulled back into the station after our 4.5 hour excursion, (good thing they warned us to bring a lunch) the crowds in Manassas had swelled to thousands attending a 22nd annual Manassas Heritage Railway Festival. The festival featured memorabilia, vendors, model trains and lots of food. 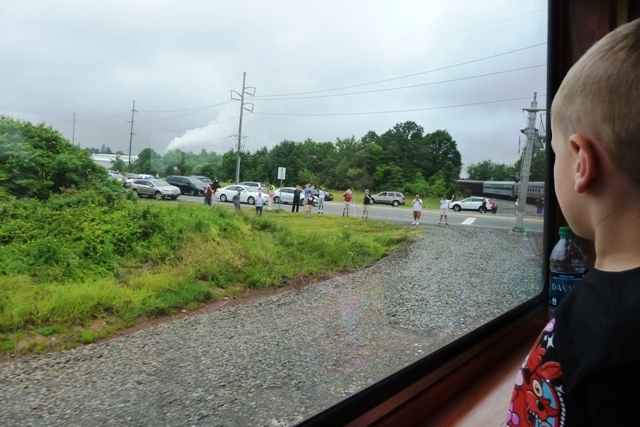 Our daughter, son-in-law, and two grandsons were there in the crowd—straining for a view of us and the train. My daughter kept texting their location to me; so I waved wildly, hoping they could see us; young James claimed to have spotted Grandma inside the train. It was like we were coming home from a cross-country jaunt instead of 102 miles in the green Virginia countryside. I should have bought the two-year-old a souvenir from the 611, but gave him instead a colorful brochure showing a picture of the train. He adores that brochure and keeps it with him in the car to look at as they run suburban errands, drive to visit us or his other grandma, or head to preschool. Who knew a brochure could sub for a knick knack? I am not very knowledgeable about trains or the 611, but much more info can be found at FireUp611.org. The 611 Magazine, which goes to supporters and anyone who’s bought an excursion ticket, provided much of the factual information for this post. You may recall me writing about my husband retiring at the end of May. This was a fun way to celebrate. We may try “chasing the train” when it comes ‘round the bend again. Since most of my readers here seem to be women, I’ll cast my comment bait this way: Are there hobbies your hubby pursues that you enjoy just to do things together? Or that he indulges in for you, for the same reason? What have you been surprised to discover on an expedition(s) you did to humor your mate or a friend? For instance, what I enjoyed most was learning about photographer Winston Link. And if you happen to be in Danville, Va., this weekend Sept. 24-25, 2016, I’m told the 611 will be “under steam” at the Danville Rail Heritage Days although not making an excursion. I enjoyed the video because trains are part of the landscape and soundscape of my childhood. Train tracks ran above Grandma Longenecker’s property – I loved to hear the whistle blow, the clackety-clack of the rails and imagine what was going on inside the cars. I wrote a blog post about trains quite a while ago pairing my memories with Alexander McCall Smith’s Trains and Lovers. About your question: I am married to an artist who isn’t wild about spectator sports. He’s not a TV sports addict, so I don’t suffer as a football “widow” for months on end. We like riding bikes, hiking in the mountains, and British drama. Yes, he even followed “Downton Abbey.” He’s good at golf, but doesn’t indulge much because of the Florida heat. I’m guessing you would truly enjoy some of the photos of Winston Link. I like your term soundscape to describe what remembered sounds can provide for us–made me think too of the “Pumpkin Vine” train track running through Goshen/Elkhart County near where I grew up (now turned into a popular biking path). We could hear it’s hoot and somehow it was a sign that all was well with the world. “There goes the Pumpkin Vine” Mom or Dad would say. Waiting for a train is of course a different matter. I was to meet a friend for lunch yesterday and headed across town and had to navigate not one but two trains which threatened to make me late: one where I never meet a train. I remember your Downton Abbey post and photos and I thought how cool to enjoy that together, even the dress up party. Thanks for your thoughts & memories.